What can I do to up the horsepower on my 2011 Mustang V-6 with a 3:31 rear end, which was installed by the factory. While there are not yet a many performance parts for the 2011 Ford Mustang 3.7 liter V6 engine, the few that are available can and will make a substantial improvement in performance. The first thing I noticed when I got a sneak peak at the new 2011 V6 Mustangs at last year's Vancouver Auto Show, were the engine's cast iron exhaust manifolds. I figured that Ford did that purposely to ensure an easy and inexpensive horsepower upgrade for some future year model. 2011 Ford Mustang BBK 3.7 liter V6 Headers and a High Flow Short Mid X Pipe, which they say will add another 25-30 horsepower to that already healthy 305 stock horsepower engine. 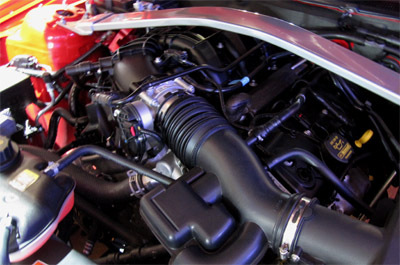 They're also offering a cold air kit which has been optimized to work best, using the 2011 Mustang V6 factory computer settings. Since the factory 3.7 V6 air snorkel and filter already flow quite well, they have created a custom integral mass air housing inside their unit's aluminum casting which achieves a new calibration of the factory mass air. setup works so well, that recalibration work with a power programmer does not produce much more improvement. Alternately, Ford Racing, has a new K&N air setup and filter element that they say flows approximately 22% more than stock filter and also doesn't require any PCM recalibration. My guess would be, that with these two simple modifications to the 2011 V6 engine, you should be able to see around the 350 horsepower level, with a nice chunk of additional torque as well. If you want to go all out, there's always adding a higher numerical ratio rear end. That's a proven performance piece even on the older 210 horespower Mustangs from 2010 on back. If you're prepared to wait a bit longer, there should be a supercharger for the new engine soon. Paxton just released a new supercharger for the Mustang 5.0 coyote V8 engine, that pushes horsepower up to 615 horsepower, so chances are, they will have one for the V6 soon. And since their previous model turned the sedate 210 horsepower 2010 Mustang V6 into almost 375 horsepower, it'll be interesting to see what they can wring out of the already powerful 2011 V6 performance. P.S. I'm expecting a report back and pictures of your 2011 after all the fire breathing performance parts are up and running! Return from 2011 Ford Mustang V6 Performance to Ford Mustang.